Abstract: In this review we'll be examining Albatron's brand new GeForceFX 5900PV 128MB videocard, which literally arrived at the PCstats Labs hot off the assembly line. For the last few years, nVIDIA were the undisputed kings of the videocard market. From high end, to mid range and even budget cards, whatever you little heart desired nVIDIA could supply. nVidia's videocards were generally reputed to be 'better' than the competition, and faster too. When ATI released the Radeon 9700 Pro VPU in the summer of 2002, things changed drastically. nVIDIA was no longer top dog, and struggled to find something in the arsenal to counter the powerful ATI offering. Playing catch up is something nVIDIA is use to, and while they've managed to remain fairly competitive in the budget and mid range market, they've taken quite a beating in the high end arena. ATI decided to use a 0.15 micron manufacturing process for their R300 core and experiment with 0.13 micron on their lower end cards. nVIDIA, who were feeling the pressure, gambled that their manufacturing partner in TSMC would have the 0.13 micron manufacturing process perfected by the time the GeForceFX 5800/5800 Ultra was ready to launch. As I'm sure everyone is well aware the gamble did not pay off. In fact it blew up in nVIDIA's face and ultimately cost them market share. Despite all the "big" numbers like 500 MHz core and 1 GHz DDR2 memory the GeForceFX 5800 Ultra could not even outperform the by now middle-aged Radeon 9700 Pro. Coupled with an extremely hot running GPU which required a ridiculously loud fan (FlowFX anyone? ), expensive DDR2 memory prices and worst of all, low manufacturing yields, it was clear the 5800 was doomed right from the start. With the GeForceFX 5800 Ultra virtually vapor ware , nVIDIA engineers quickly set out to work on the NV35 core. While it's too early to say if nVIDIA are back in the saddle, the release of the GeForceFX 5900/5900 Ultra nVIDIA is certainly heading in the right direction. In this review we'll be examining Albatron's brand new GeForceFX 5900PV 128MB videocard, which literally arrived at the PCstats Labs hot off the assembly line. It is too soon to say exactly what the retail price of this package is, but nVIDIA's MSRP for GeForceFX 5900PV based videocards is around $550 CDN ($399 US) so I would anticipate something similar here. The FX5900PV comes in a nifty carry case which through us for a loop as I thought Albatron had sent a notebook by accident! 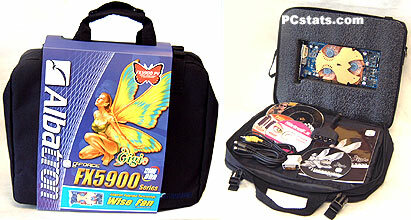 The Albatron GeForceFX 5900PV is packed securely in a block of antistatic closed-cell foam inside the nylon notebook style bag, which also includes a full version of Duke Nukem: MP, a five game demo/lite CD, Power Director and Power DVD among other items. Because the card supports VIVO, Albatron also a VIVO break out box a S-Video to S-Video, and a composite to composite cable. An analog to DVI converter is also bundled in with the package as well. Unlike 99% of the GeForceFX 5900PV Ultra's which are built by Flextronics (nVIDIA's board partner), I'm pretty positive that the Albatron GeForceFX 5900PV is actually built by Albatron. 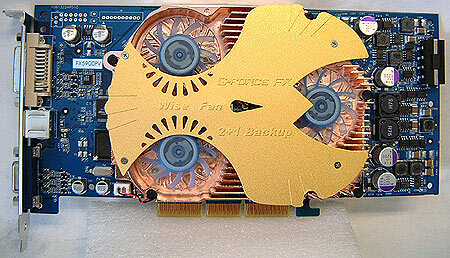 Albatron have always used a blue PCB for their videocards and the GeForceFX 5900PV is no different. As you can see Albatron uses a rather large copper plated aluminum heatsink that has three 'wise' fans (we'll get a bit more into that a bit later). Albatron employs the Phillips 7108AE VIVO module with their GeForceFX 5900PV videocard. These days it's not good enough to have a fast videocard, you must also have well rounded multimedia options as more and more users are taking advantage of these features. Pg 15. So, you want a FX5900!